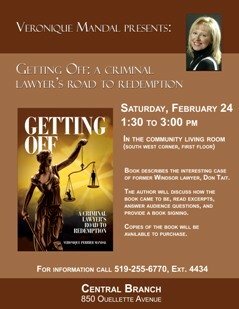 The latest book from journalist and author, Veronique Mandal, profiles former Windsor criminal lawyer, Don Tait. Entitled, GETTING OFF: A CRIMINAL LAWYER’S ROAD TO REDEMPTION, Mandal follows the trail from Tait’s high octane lifestyle in Windsor, through his recovery from addictions, to his final days in Africa. Mandal will be presenting excerpts from her book plus her adventures researching it, in an author talk at the Central Branch of the Windsor Public Library on Saturday February 24. The event is scheduled for 1:30 to 3:00 p.m. in the Community Living Room on the main floor. There is no admission charge. Copies of the book will also be available for purchase.